I learned my lesson with hesitating on Overstock. I had bookmarked this rug about six weeks ago, pondered over it for several days, finally made the decision to buy it, and found myself staring in despair at the menacing "SOLD OUT" on my computer screen. I was legitimately disappointed. I really really liked the rug and couldn't get over the ridiculously low price tag ($70). 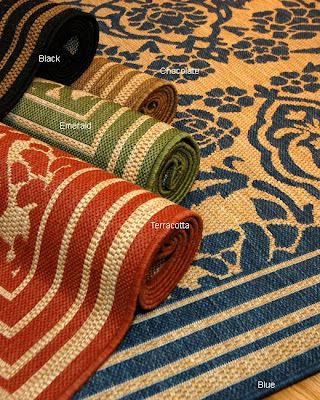 For those of you who happen to be seeking quality area rugs, you know what I am talking about. But then, last week, the God of Decorating came through for me. I received an email from Overstock letting me know that the rug was back in stock. I was too afraid of losing it a second time, so, on my lunch break, I gleefully placed the order for a 6x8 rug in "Emerald." It came today. And it is perfect. I just learned that Overstock ships everything - even furniture!!! - for $2.98. But UPS won't carry it into your apartment. A great deal as long as you're home to receive it and have some strong people to help you lift things.